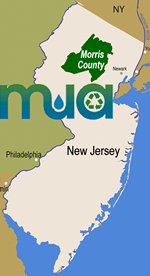 The MCMUA provides curbside recycling collection service for Wharton Borough residents. Note a change in recycling collection schedule for 2012. Where recyclables have been collected every other Thursday and Friday in two sections of town, the pickups in 2012 will take place every other Monday in the entire town, starting Monday, Jan. 16. The last Thursday collection in 2011 will be Dec. 29, with the last Friday collection in 2011 coming on Dec. 30. Collection does not occur on major holidays. 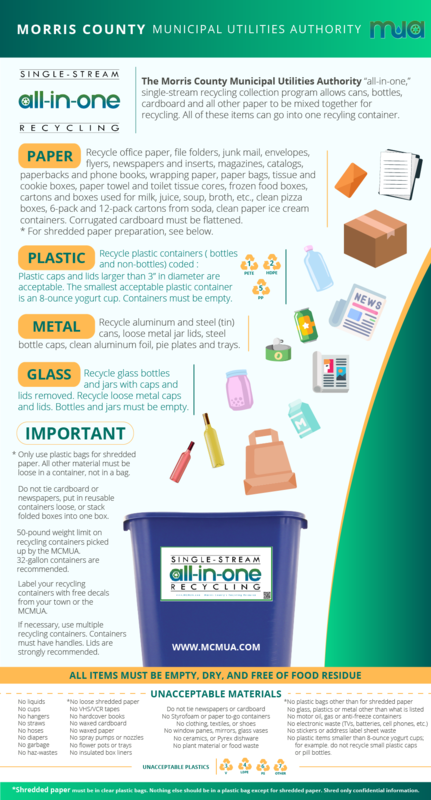 For Borough of Wharton, the MCMUA collects single-stream mixed recyclables. This means that aluminum, glass bottles and jars, steel cans and plastic containers can be mixed with recyclable paper including newspaper, corrugated cardboard, junk mail, office paper, magazines, cartons, etc., for curbside collection. Additionally, none of the newspaper or cardboard needs to be bundled or tied. There is still a 50-pound weight limit on the recycling container put out at curbside for collection by the MCMUA. Wharton also operates a municipal recycling depot where certain recyclables can be dropped off for recycling. Click here to read about Wharton's municipal recycling depot.